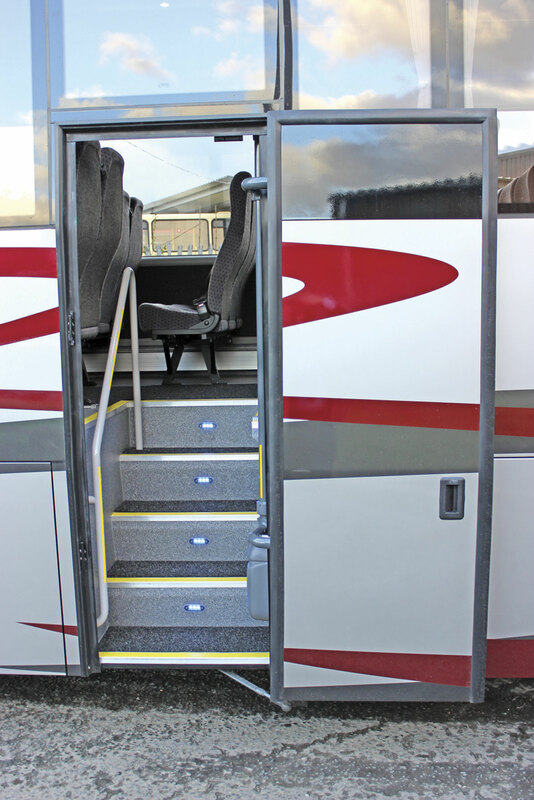 BASE Coach Sales’ unveiling at Euro Bus Expo of the new MOBIpeople range of single deck options marks the latest stage in the company’s ongoing mission to provide vehicles that match operators’ needs and can be operated profitably. 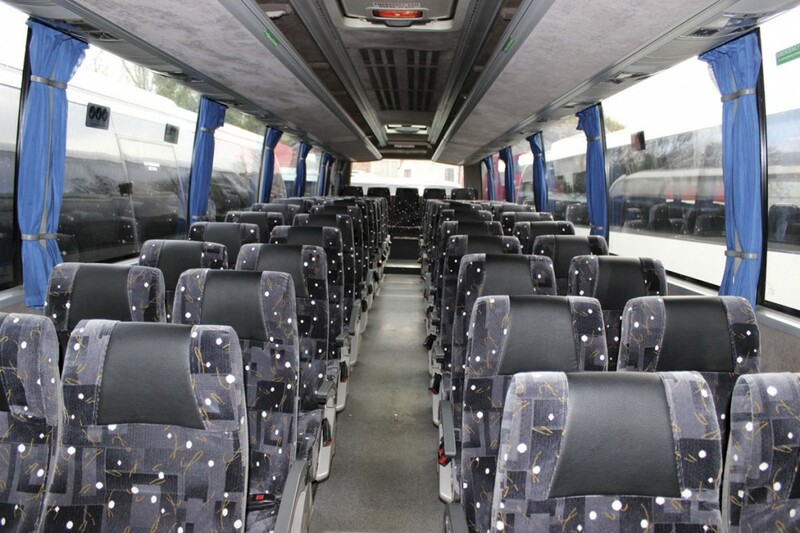 The BASE team, with the experience gained from running the 160 strong Holmeswood fleet, has developed particular expertise in the high capacity 57 and 70-seat markets and also has a reputation for the supply of smaller coaches with bespoke yet flexible specifications. After seeing the first right hand drive MOBIpeople products at the NEC, Stuart Jones headed up to BASE’s Leyland site to meet with Mark Aspinall for a recap on what went before, a closer look at the Explorer II and a more detailed discussion of the company’s plans for the brand. BASE began offering Marcopolo coachwork in 2003, supplying 164 vehicles including many for its own fleet, before the Coimbra plant in Portugal was closed late in 2008. Many were luxury coaches but close to half were practical and competitively priced entry level vehicles with 57 or 70 seat configurations. In total there were 74 of the low height 330 model, as well as three high floor Viale HFs and seven low floor Viale buses. Some 330s were on Iveco EuroRider chassis but most, and all of the Viales, were on MAN chassis built at the Salzgitter plant. 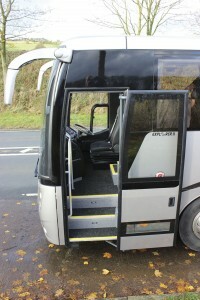 The Marcopolo 330s had styling that echoed that of the 350 and 370 coach ranges and most were equipped either with wheelchair lifts or the provision to add them at a later date. 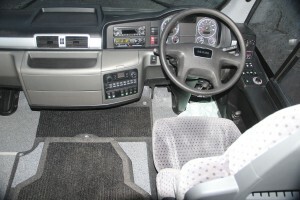 The Viale HF was a late development of the Viale low floor bus model introduced prior to the recession with a raised flat floor to enable high capacities and luggage provision. 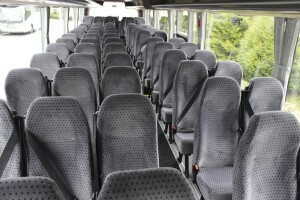 As well as the Marcopolos there were also a limited number of 70-seaters produced with Beulas Spica coachwork but this was only a short term option because the updated European regulations that took the calculation per passenger from 65kg to 71kg meant that the Spica could no longer comply. Three were delivered to AAA Coaches on MAN A91 chassis. At the time, Tata Hispano were looking for a UK distributor and BASE saw an opportunity for the 12.25m long Intea with 70 seats and two nearside doors that would sit midway between the former Viale HF and Marcopolo 330 products. 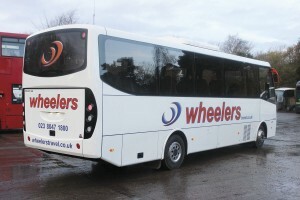 Mounted on the A91 chassis it had an inter-urban look to it, winning eight orders from Impact Travel (2), Gwynne Price (2), Harry Shaw, AAA Coaches, Merryhill Coach Travel and Southampton based Wheelers, who are also the launch customer for the MAN TGL based MOBIpeople Midi Explorer. The Intea is unusual in that there have never been any examples in the Holmeswood line up, a fact Mark attributes to always having sold them before any made it on to the fleet. Unfortunately, Tata Hispano decided to close its Zaragoza plant in 2013, though it kept the facility in Marrakesh, Morocco, open, so once again BASE was left without a product in this sector. Mark feels that though relatively short lived, the relationship with Tata Hispano was worthwhile. 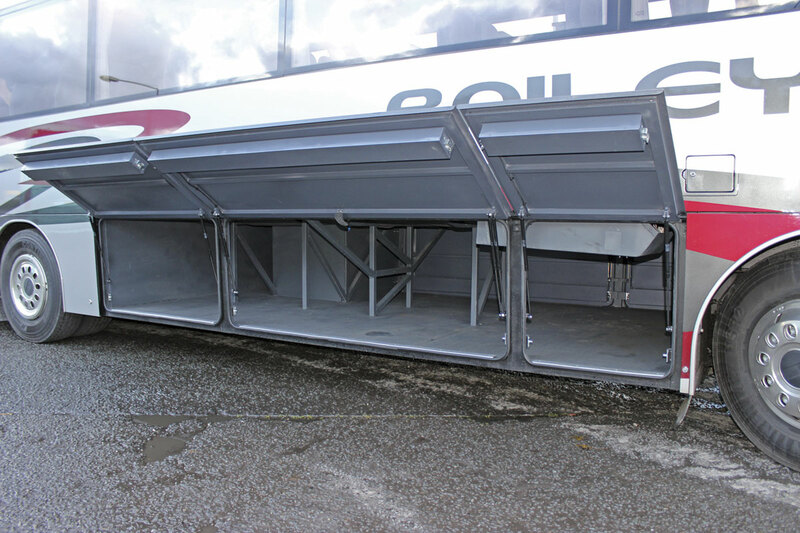 One benefit had been the introduction of the full sized twin nearside door concept to the UK market. 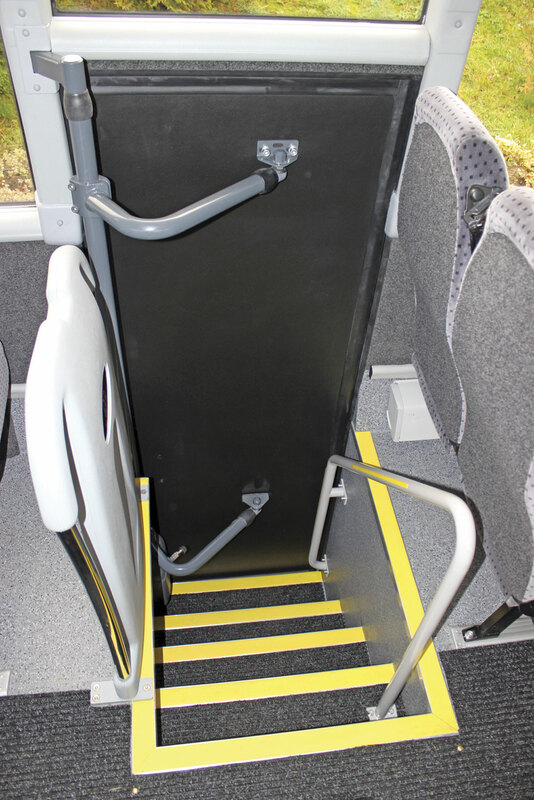 It would have been possible at the time to specify a continental offside door but operators who had taken the vehicles had since said what a good concept it was, greatly reducing boarding and alighting times. Determined to remain in the sector they knew best, and for which they were sure that demand remained strong, another partner was sought. MOBIpeople had grown out of the ashes of Marcopolo, firstly repairing and refurbishing vehicles and subsequently building in small numbers for niche markets in the Benelux, Icelandic and African markets. A recent order has seen 18 MAN A66 chassis bodied for Bermuda through Mercury Trading and another saw 16-seat hybrid Mitsubishi Canters produced for the Portuguese National Parks department. The whole of the MOBIpeople workforce of 76 was formerly employed at Marcopolo. At Christmas the company will move to a new manufacturing facility in Coimbra which will be around half the size of the old Marcopolo plant and will enable it to increase production levels without losing the ability to be very flexible in what they build. BASE had been buying Marcopolo parts from them and had a good relationship with their senior managers headed by General Manager, Antonio Catarino, who they had been dealing with since they started importing in 2003. Antonio was invited to the UK to discuss not only the Explorer but also, bearing in mind the demise of the Vario, the Midi Explorer product. Back in Marcopolo days, three examples of the Senior midicoach had been imported so there was also some joint history in this sector of the market. The brief was to develop a 70-seater with two nearside doors that looked like a coach and was easy to use with air conditioning, double glazing and good luggage capacity. As Nick Dodgson pointed out, ‘Appearance is important to the appeal, though function is always the BASE mantra.’ After the initial meeting the BASE team flew to Coimbra to see the drawings produced and after discussions, including a reduction in the overall length of the Explorer II, the decision to go ahead was made. It came in on budget too. Subject to specification and trim the Intea had been £155-£160,000. Having gone to Euro6, which generally adds close to £10,000 to the price, Explorer still comes in at £160,000, though there have been a couple of price rises on the chassis this year. In terms of the MAN chassis used, to begin with the 310/360hp Euro3 D28 engined MAN A51 was chosen, switching to the 280hp D08 powered Euro3 MAN A91 and then the 290hp D08 (EGR) powered A91 with the advent of Euro4. The A91 was fitted with a five-speed ZF Ecomat automatic transmission, switching to six-speed towards the end of its run. With Euro5, the A91 became the RR8 featuring a 293hp EGR engine that was now matched to the ZF EcoLife transmission. At the same time, because the beam front axle was not initially available, BASE went over to an independent front suspension layout which was subsequently adopted as their standard. 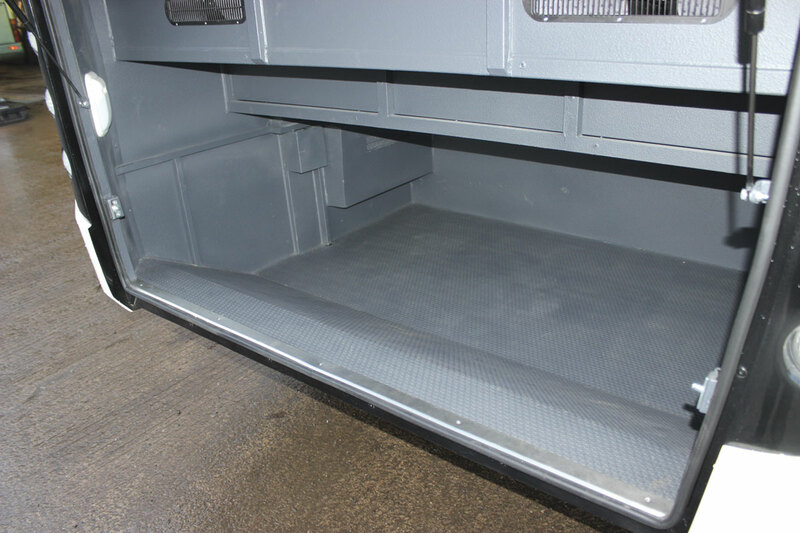 A 480-litre fuel tank over the front axle enabled them to maximise luggage capacity. 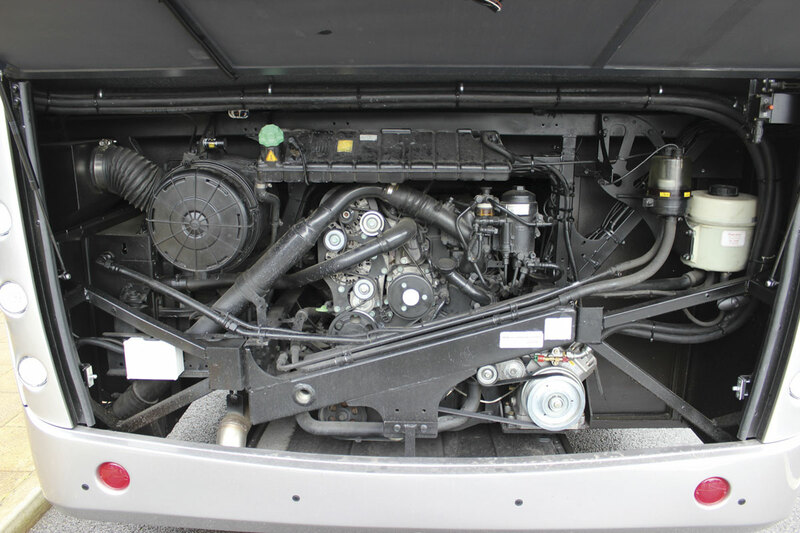 Euro6 has seen little change as the same 293hp engine is used, now with the addition of SCR emission control technology requiring AdBlue additive. The transmission remains the EcoLife and the rest of the specification is carried over. Aspects of the current chassis specification include: The 6.871-litre D0836-LOH72 Euro6 engine which develops 290hp/213kW at 2,300rpm and peak torque of 1,100Nm at 1,200-1,750rpm. The six-speed automatic transmission is the ZF EcoLife 6AP1200 with five stage integral retarder. Using fully synthetic oil, this has an oil change interval of 180,000km. The chassis is equipped with the ESP electronic stability programme, cruise control, EBS braking, disc brakes and ECAS suspension. Suspension is independent at the front, while the drive axle has a 1:5.67 ratio. The standard fuel tank is 400-litres but there is a 480-litre option while the AdBlue tank holds 60-litres. ZF supply the Servocom 8098 power steering system. The 24-volt electrical system has two 12-volt 225Ah maintenance free batteries and two three-phase ac 28.5-volt 120A alternators. Wheels are ten-hole 22.5 x 8.25 units. If, as anticipated, GVW limits are increased next year, the front axle weight limit will be capable of increase from 7.1-tonnes to 7.5-tonnes if 315R tyres are substituted for the 295R tyres fitted. 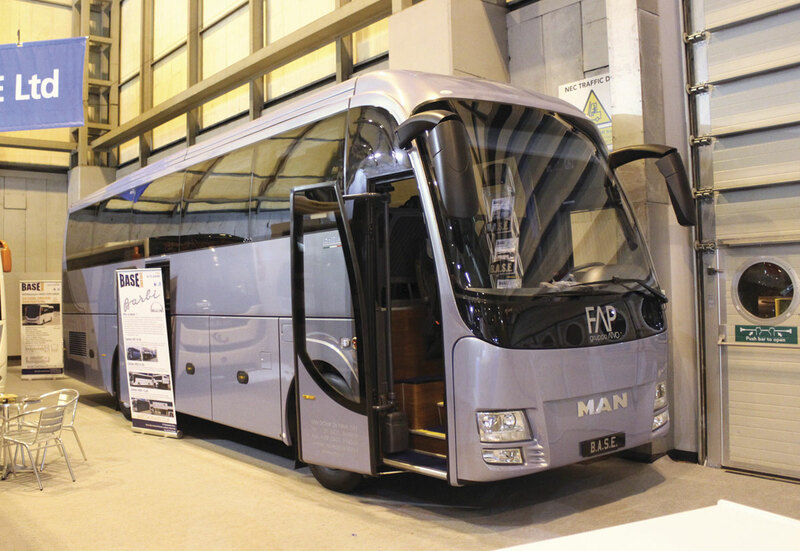 With very little time to spare before stand build up began, the new coach arrived in the UK on the Friday with Euro Bus Expo’s doors opening on the Tuesday. Entering via the front door the step arrangement is a good one with three steps from the ground to the platform and thereafter a further two to the flat saloon floor. To the left of the stairwell is a curved tubular handrail that sits proud of the dash which can incorporate a top-loading fridge. The top step at the centre entrance, although legal and well marked with yellow edging, protrudes further into the aisle than I would like, a point on which the Aspinalls agreed. 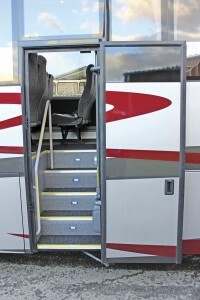 They will be altering the show coach and future examples employing the same Z-step arrangement that is used for the other steps. Five steps take you from the ground to the aisle with a good handrail to your left and verticals on either side of the decency screen on the right. The centre door itself has no kerb window giving it a rather utilitarian look from the inside. 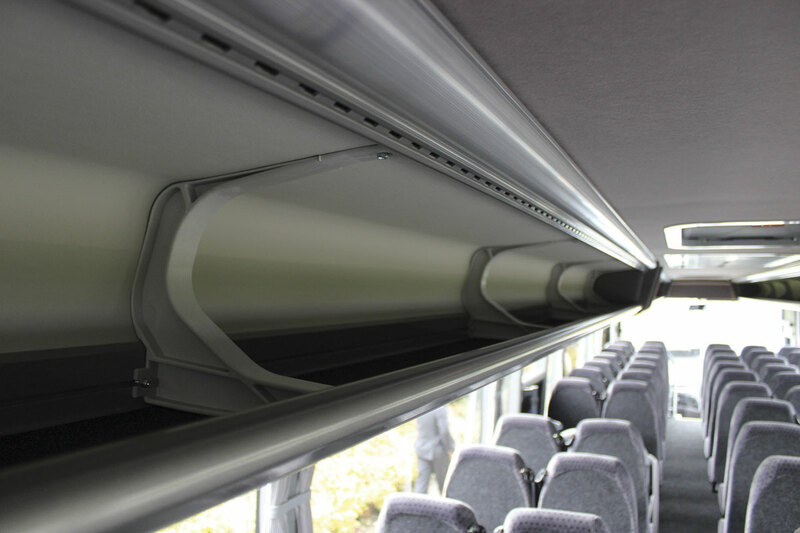 Mark did not think that it was an issue on a 70-seater but a window will be standard on a 57-seater. Inside the look is simple but not unattractive. The racks are exactly the same units used in the Intea with passenger service units that are functional if perhaps a little plasticy. There are two enclosed roof hatches with the air conditioning grille mid way along the ceiling. The rear window helps lighten the look. Ribbed carpet was fitted down the aisle and under the seats as far as the single tracking rail on each side. Side casings were trimmed in the same soft trim as the seat backs. I find it amazing how many coaches have poor shoulder room in the rear corner seats, but you can’t criticise the Explorer II for this, it has to be one of the roomiest in this regard that I have encountered. With only five seats across the full width, kids are going to be making a beeline for the back row. 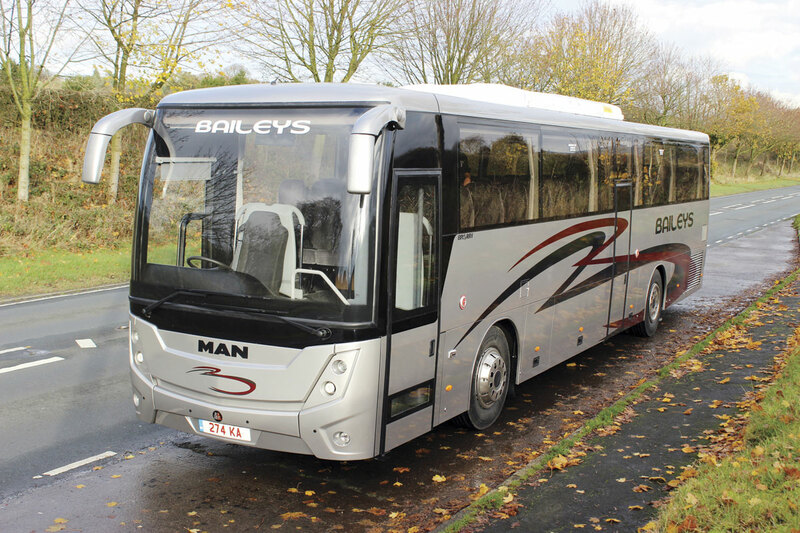 The first two Explorers have both been ordered by Newbury based Baileys Coaches, an existing BASE customer already running Marcopolo and Beulas products in their fleet. 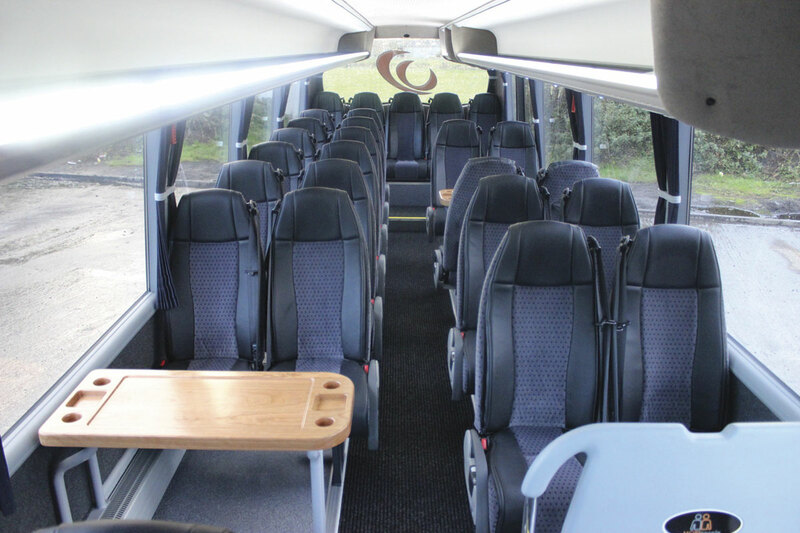 Winning a contract from an educational establishment prompted them to order two 70-seat Explorers and a 12.72m Beulas Spica 59-seater, also on an RR8 chassis. The trio, all of which are now in the UK, will be delivered as soon as the R66 rollover certification documentation has been completed at the IDIADA facility in Spain. Rather obvious failings were the soft trim panels around the front sides, especially those above the driver and the entrance door which were full of indentations and looked untidy. These are to be changed. Out on Lancashire’s roads, including one of the country’s smoother motorways – the M65 – the MAN performed well, giving a very good ride. It was windy and at times you could feel the wind catch the coach very slightly, but not disturbingly so. The main offside mirror did suffer some vibration, a phenomenon Mark was confident was curable though he thought it likely that an additional mirror would be added at the base of the driver’s window. Performance was good. On the level at 50mph in sixth it was showing 1,150rpm and at 62.5mph/100kph it had risen only to 1,450rpm. On a slightly uphill section, 40mph in fifth was achieved at 1,100rpm and 50mph, still in fifth, at 1,450rpm. Sat behind the driver you could see the gear numbers alter on the dash display, but you could rarely feel the change point as it moved up the box. ‘Nice progressive brakes’ said Mark stopping rapidly as a set of traffic lights changed colour. Returning via the A59, there was a slight dipping in the ride from time to time, but nothing to be concerned about. One of the convector heaters was rattling until Graham fixed it. Particularly efficient in operation, we asked Mark to turn the heating down. As shown, a half blind was fitted. A full width unit will be standard and the first example retrofitted. Though the main purpose of the visit was to experience the Explorer II, I was also keen to take a closer look at the Midi Explorer, necessitating a dash to the Rufford depot to get some pictures before the light disappeared. Unfortunately, there was not time to take it out. 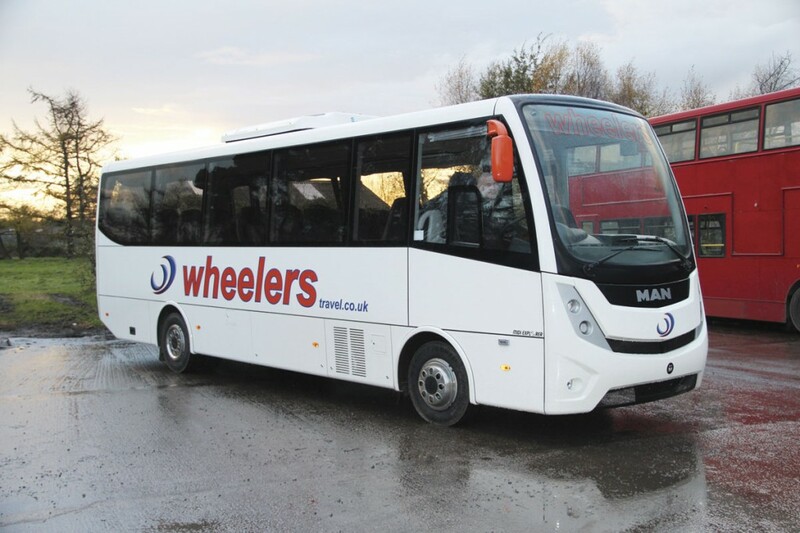 Mark explained that, with the demise of the Vario, they wanted a specification that most closely matched the market leader at the time, which they considered to be the Plaxton Cheetah. ‘We wanted 33/29 seats, double glazing, air conditioning, and a minimum of 3.5 cubic metres of luggage capacity within a wheel forward design,’ he said. To achieve this they turned to the MAN portfolio again. MAN had mentioned prior to Christmas 2013 that they were undertaking M3 homologation on the TGL for Nu-Track and that they were talking to potential coachbuilders about a coach version. Mark recalled, ‘We thought it was a good base to build on, especially as the exhaust was on the UK offside which enables both wheel forward and door forward options. We’ve gone with the wheel forward. We may develop a 12-tonne door forward model in the future (which could have 41 recliners), but it would be more expensive and nobody has yet asked for it. It will be customer driven.’ The transmission is the MAN TipMatic (ZF) 6AS800D automated six-speed unit and rear air suspension is fitted. Vogel Primus recliners finished to Ambassador specification with leather flaps were fitted. 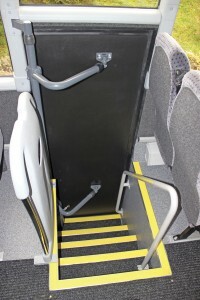 The maximum capacity is 33 with recliners at 9.1m but 35 can be achieved in a schoolbus specification. 29 seats or a 24 seat executive are other possibilities. I found the space left ahead of the rear row on the nearside rather disproportionate and would probably have opted for respacing. A continental door arrangement can be fitted here if required. Pricing for the 10-tonne TGL MOBIpeople MidiExplorer starts at £119,995 which is competitive. A major advantage with opting for the TGL is that it is fully supported by the MAN network who are very familiar with it. The Aspinalls are also confident that fuel economy will be good. Driving it back from Portugal for the show when it was still restricted to 90kmh as a truck chassis, Francis Aspinall achieved 19.8mpg. 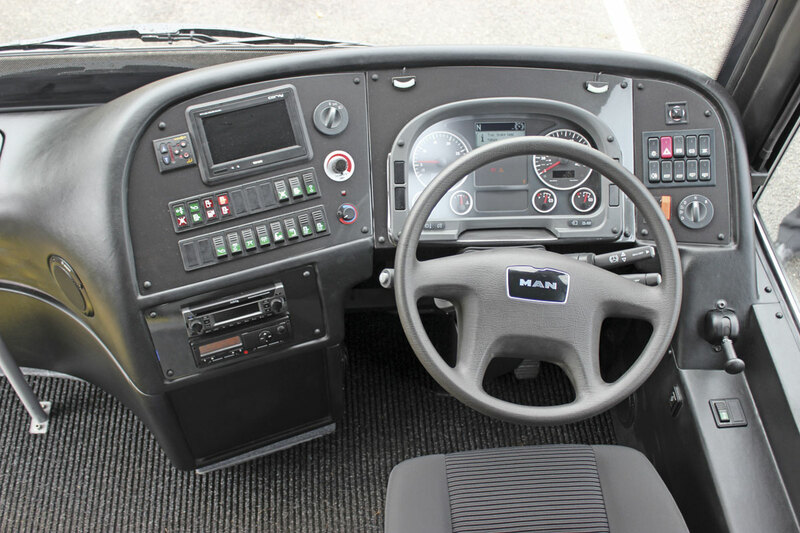 Since arriving in the UK the top speed limiter has been reset to coach specification that will see it recording 1,750rpm in top at 100kmh rather than the 90kmh standard in trucks. With 180hp there should be plenty of power available, though there is also the option of a 220hp version of the four-cylinder D0834 in the 10-tonner. Standard in the 12-tonne TGL is the six-cylinder D08.36 rated at 250hp. Successful M3 testing of the 12-tonne chassis had been completed at MIRA on the day prior to my visit and as we spoke, Holmeswood MD, Francis, was driving it south to Portugal for bodying. As well as the new MOBIpeople range, BASE is also to import Barbi coachwork on MAN chassis, a left hand drive example on an MAN RR2 chassis having been displayed in Birmingham. 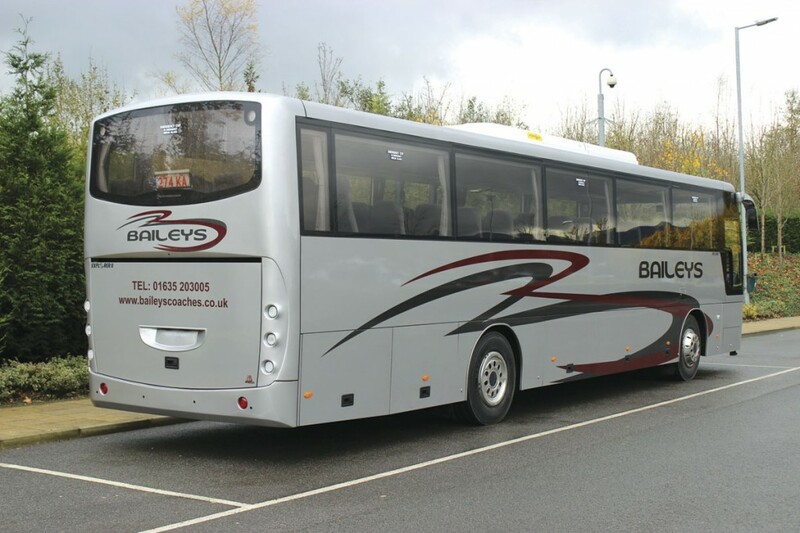 Offering Barbi is a new development that has come about following the transfer of the Beulas franchise to the associated Moseley group of companies. Mark Aspinall explained that this change was an entirely amicable one stemming from the Beulas family’s aspirations to supply in greater numbers than BASE could have handled. There are still Beulas bodied coaches built or in build that will be supplied through BASE, among them an MAN RR8 Spica for Baileys and another for Bansteads. Three models are being offered. These are the 10.35m Galileo HD, the 12.2m Galileo HDL, on two axle MAN RR2 400hp engined chassis and the 13.8m Galileo HDH on the three-axle 480hp engined RR4. The HDH will be fitted with 61 seats, a toilet and 20 cubic metres of luggage capacity. Prices, as previously reported are around £20,000 more than currently asked for the Beulas range. 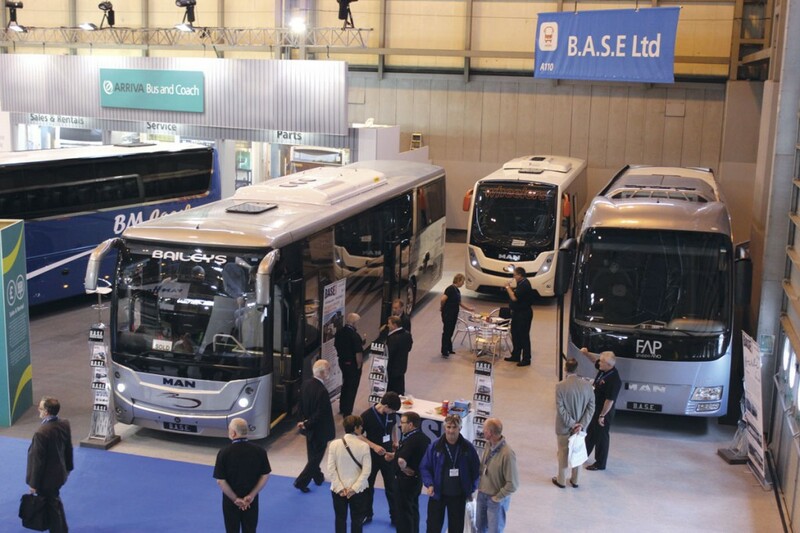 It would be wrong to see BASE as a dealership concerned only with the sale of new vehicles; so far this year they have already supplied 68 used coaches and buses. With 120 licences already and a further 20 just awarded to enable them to take on additional school contract work, the 160 vehicle fleet both provides the opportunity to run vehicles taken in part exchange and also represents a stock resource in itself as it will usually contain a vehicle matching the specification a prospective purchaser needs. Through BASE, a great deal of conversion work on existing vehicles is undertaken, either in preparation for roles within the fleet of Holmeswood and its associated brands or for onward sale. Among the interesting projects being tackled when I was there were Caetano Levante bodied two and three axle Scania K340s, formerly used on National Express work with a variety of fleets, which were being converted for second lives with higher seating capacities. Six 2007 two-axle coaches are being converted to 57 seaters and have been completely retrimmed by Duoflex. 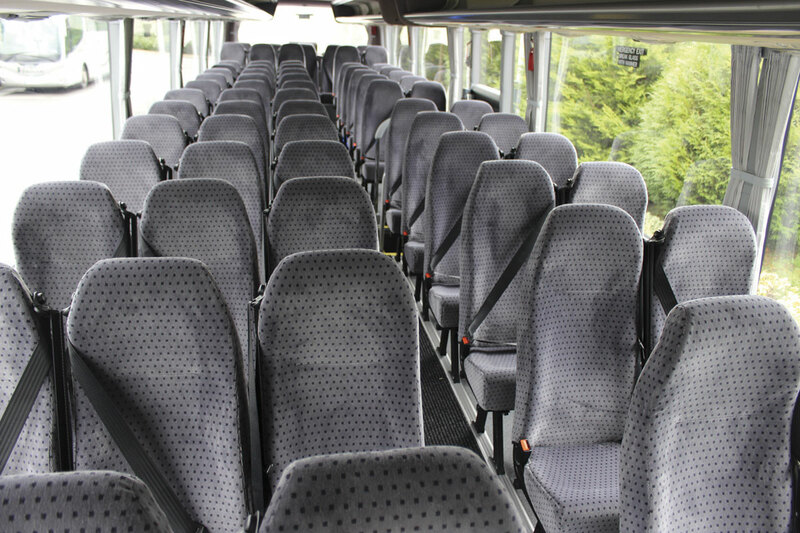 The necessary tilt testing has been done for 70 seaters (3+2) to be produced once the anticipated increased GVW/axle weights come into force next year. The front step lift and the convertible wheelchair bay at the front nearside are removed as part of the conversion. Afterwards, as Mark explained, ‘it doesn’t look, feel or smell like a National Express coach’. With the tri-axle 14.2m long Levantes, dating from 2008, the approach is to undertake similar work and then fit 71 new Fainsa Gaudi recliners in a 2+2 layout. Work on the first coach has just started. They are already being advertised on the BASE website at £69,995 for the two axles and £79,995 for the 71 seaters. A visit to Leyland is never dull. The site has one of very few working tilt beds in the UK and when I called Optare’s blue London-specification MetroDecker was sat on it at a jaunty angle. Around the yard were a large number of Dennis Trident Plaxton President double deckers, formerly with either Brighton & Hove or TfL contracted fleets. Many are being used on local school contracts and others are being prepared for sale to other operators after refurbishment, reseating and conversion to single door. Such is the demand that many of Holmeswood’s own buses still carry Brighton colours 14 months after they were bought, so one bus resplendent in metallic green caught my eye. It looked like any other 03-plate Trident but Mark lifted the engine cover to prove me wrong. The bright yellow of the block revealed that it was fitted with a Caterpillar C7 unit, one of a small number thus equipped when ADL was looking at its options for Euro3. Warranty on MOBIpeople bodies is two years and the chassis is covered by a full one year warranty plus a second year driveline only warranty. There is a menu of extensions available to the MAN warranty on a paid for basis. 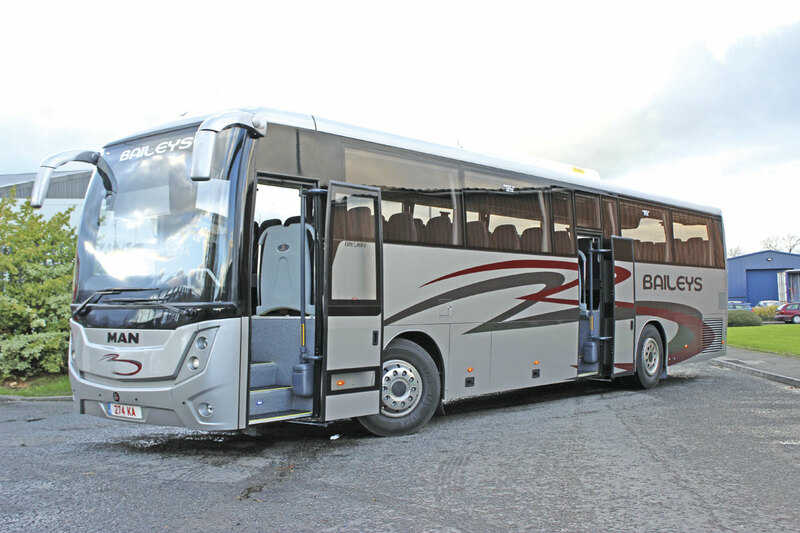 Prices quoted by BASE are always near net, but at £160,000 the Explorer II is a coach that has good earning potential and gives an operator a chance to make a profit with it. Alternatively, a 57 seater with Vogel three point belted seats and ten cubic metres of luggage would cost £172,000.